Miller has introduced a new compact, turnkey submerged arc welding solution — the SubArc Portable Welding System. This self-contained, ready-to-weld system contains the power source, column and boom on a mobile platform. Miller Electric Mfg. 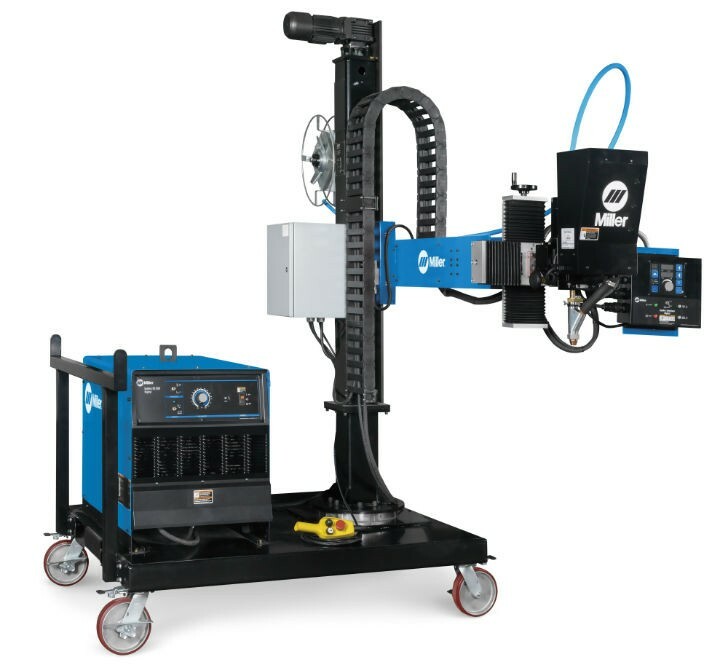 Co. has introduced the new SubArc Portable Welding System, a self-contained, ready-to-weld system that can be easily positioned and adapted to meet the needs of the application. Built to provide exceptional flexibility in submerged arc welding (SAW) applications – including those found in pressure vessel, pipe fabrication, construction and manufacturing – the SubArc Portable Welding System contains the power source, column and boom on a mobile platform. The result is a compact, turnkey submerged arc welding solution. The new offering is designed for use with the SubArc Digital Series power sources from Miller, a lineup that includes DC power source models ranging from 650 to 1,250 amps, and an AC/DC model offering 1,000 to 1,250 amps. In many shop environments, the submerged arc welding application involves restricted space or confined parameters, which makes equipment flexibility a necessity. With built-in fork pockets and caster wheels, the SubArc Portable Welding System provides mobility options to move the entire system to the workpiece. In addition, easy positioning of the weld head to the point of the weld on the workpiece is possible through use of an integrated motorized column, manual telescoping boom, cross slides and 360-degree column rotation. This contributes to the system’s ability to reach where the weld is needed. The system’s flexibility accommodates workpieces of various heights and sizes. The motorized column with pendant control provides 44 inches of vertical travel, and the manual telescoping boom provides 31 inches of horizontal travel. The manual cross slides provide fine vertical and horizontal torch adjustment. With a team of welding professionals dedicated to submerged arc welding, Miller designs and integrates the solution that best meets the needs of the customer’s application – and offers support following installation.